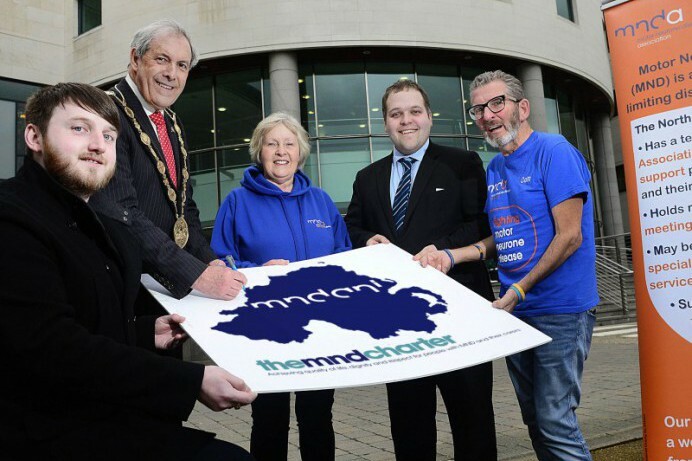 Lisburn & Castlereagh City Council has agreed to adopt the Motor Neurone Disease (MND) Charter, in support of local people living with this terminal disease and their carers. MND is a fatal, rapidly progressing disease that has no cure at present. Unfortunately, many people living with the disease are not receiving the care and support they need because it is still widely misunderstood. The aim of the Charter is to ensure that people with MND receive the right care, in the right place, at the right time. The Charter is a statement of the respect, care and support that people living with MND and their carers deserve and should expect. Colm Davies OBE is a campaigns volunteer for the Motor Neurone Disease Association Northern Ireland (MNDANI) and lives with MND. He said: “The organisation supports people who are living with MND. I see every day what a difference the right support and care can make, not only to people like me with MND, but also to our families.